I say that because (fortunately) most candidates are doing well in their case interviews. The main reason is probably just because there is a lot of stuff out there to prepare and everyone talks about it. But so many candidates fail miserably in the Personal Experience Interview. I hate to see this because it is a show stopper for your McKinsey offer which would have been easy to avoid. A lot of candidates have the potential to get into McKinsey but just fail to deliver their PEI correctly. And therefore do not receive their desired offer. Unfortunately for those candidates, they only find out in the aftermath, once it is too late. Please, please, please make sure to avoid this situation for yourself and prepare intensely not only for your McKinsey case interviews, but also for the PEI! Before looking more closely into how to organize your McKinsey PEI prep, let’s first understand the top 3 reasons why so many candidates fail in the PEI at all. … even though it is mainly the same routine for every interview they do. And there is hardly any useful information around which is detailed enough to base one’s serious PEI prep on it. For McKinsey, it is equally important as the case interview – you might get initially hired slightly more for your analytical problem solving skills, but McKinsey likes to see potential engagement managers (and maybe partners) in their candidates for the long run. And for this position, a strong score on the PEI is a good predictor for future success. However, it is an interview format of its own which actually is not difficult by itself, but it just follows its own rules and procedures (that a candidate needs to be aware of to do well). It is easy to differentiate yourself from other candidates if well prepared. And keep in mind that the PEI always comes before the case interview. With this part you can already set the stage – whether your whole interview will become a virtuous cycle or a vicious cycle. If your PEI is awesome, it is just human nature that interviewers will have a positive impression about you. Thus they might be slightly more helpful during the case interview every now and then. And this will finally make a big difference for the overall outcome. Sorry for taking so long before coming to my answer. But giving some general context information about the PEI is important as well. Develop a clear understanding of each PEI dimension and what McKinsey is specifically looking for in each of those 3 dimensions (Leadership, Personal Impact, Entrepreneurial Drive). Identify suitable situations from your recent past, critically looking over your CV and any other past experiences you had in addition. For now, there is no need to go into much more detail yet. Have 1-2 McKinsey PEI coaching sessions (depending on how well your examples fit to what McKinsey wants to hear at this point in time) in order to discuss the fit of your examples to McKinsey requirements. Make the appropriate adjustments, and define together where to put the focus and dive deep in your examples. Update and fine-tune your 3 examples on your own and go into the details. Start each example with a headline format for quickly giving the interviewer an overview about what the situation is about, before diving deep after the first 1-2 minutes in the PEI. In addition to the first set of 3 examples already prepared right now, start preparing additional 3 examples as your “backup”. This is needed for several reasons, without going too much into the details now – you will find more details in The Ultimate McKinsey PEI Prep eBook. Usually it makes sense to wait with preparation of the 2nd set of your 3 examples after you (more or less) finished the 1st set of your 3 examples. But why waiting for this? Because you will learn a lot from that which you can then already apply when preparing the 2nd set of our 3 examples, thus making the whole process much more efficient. Finalize each of your 6 examples to have them basically ready for your Personal Experience Interview from your side. Have another 1-2 McKinsey PEI coaching sessions to go through your now well-defined examples in a mock interview setting for a final revision and reality-check. Practice, practice, practice to deliver your PEI example confidently also under the pressure of your real McKinsey interviews. During my coaching sessions with hundreds of candidates over the last couple of years, I made the following observation. More often than not, there is a huge gap between what candidates think they apply on their examples vs. what they actually apply. Take it seriously and plan for enough time for finding, defining, fine-tuning and practicing your PEI examples! It makes a crucial difference in the outcome of your Personal Experience Interview. It is exactly the difference between safely passing the McKinsey PEI vs. losing your McKinsey offer. Just to be very clear on this one: without a close-to-perfect PEI, you will not get a McKinsey offer, no matter how well you did in your case interview. Knowing a lot of things about the PEI theoretically will not be enough to achieve a close-to-perfect interview performance (which is, by the way, the kind of performance level McKinsey is expecting from you). Make sure you don’t only prepare your examples on a sheet of paper and practice them in front of a mirrow, but practice your PEI in a real-life mock-interview with a skilled interviewer! 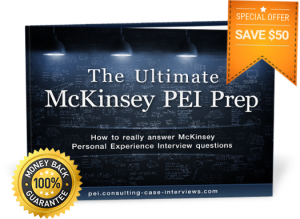 Next Next post: What are some typical McKinsey PEI questions during your interviews?